Hope for Belper bought together folks from across the congregations to put together Christmas Hampers for those of our neighbours who through numerous circumstances would have been unable to celebrate Christmas with a festive family meal. 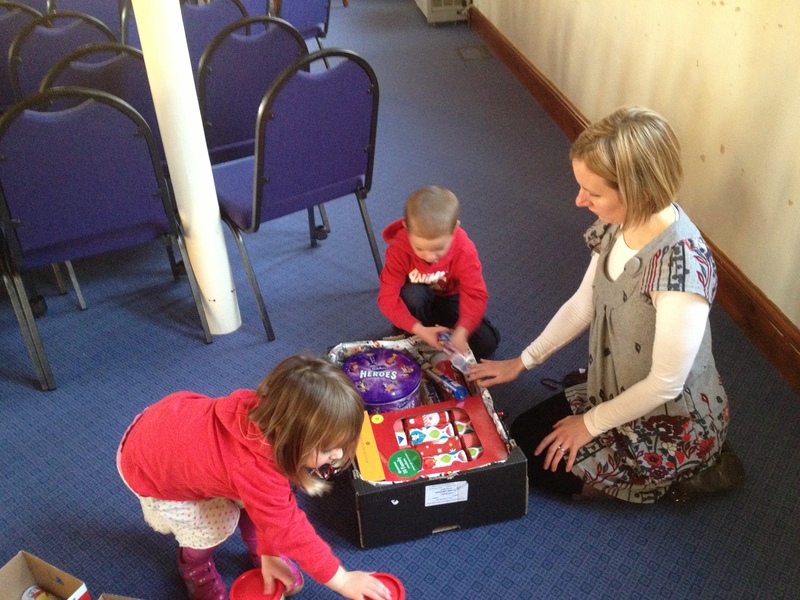 Christians from many local churches responded with amazing generosity to sponsor hampers to the tune of £1,600. This meant that on the day we were able to shop for and put together 33 hampers instead of the initial 20 planned. The staff at the Sure Start Children’s Centre were delighted to be able to support so money more families in this way. Many thanks to all those who supported the project again this year, from some anecdotal feedback and a note from one family the provision of these hampers means a lot to those who receive them. Many thanks also goes to ‘Inspirepac’ for specially making and gifting the hamper boxes to order. Christmas Eve also saw Hope for Belper out on the Market Place once again supporting the Town Council Carol Service. This event is always well attended and the cup of hot chocolate has become a fixture over the years. Around 500 cups were served and our thanks go to the management of The Black Swan for once again allowing us to work out of their kitchen and also to No.28 for supplying tables. 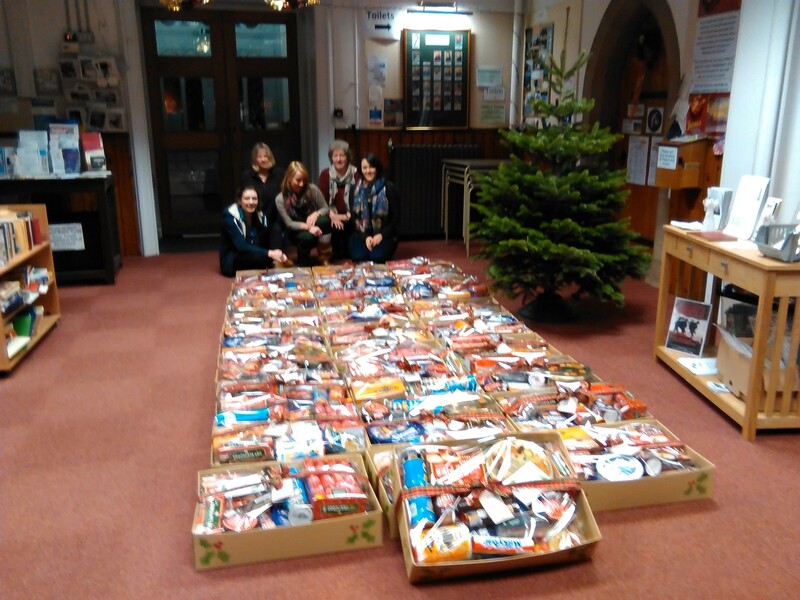 The Hope team were together again for Christmas Hamper packing on the weekend of the 8th December. In previous years, folks from the town lead by the Community Church have been out on a pre-Christmas shopping spree to put together a number of family Christmas hampers for families across the town who would otherwise struggle to celebrate in the traditional manner. This year with extra funding from the Baptist congregation and the Community Church, Hope have been able to partner with the Belper Family Centre to supply 15 hampers this Christmas. Most of us take for granted the ability to be able to put some kind of a festive feast on the table, but this is not necessarily the case for all our neighbours across Belper. The Children’s Centre identified 15 families with whom they have had significant contact over the past year and for whom hosting a family Christmas day would be, to say the least, financially problematic. It is for these families that Hope were able to be a significant blessing this Christmas, by delivering a hamper of goodies including traditional favourites such as Yule logs, Christmas puds and stuffing etc along with a £20 Howarth’s meat voucher. A great time was also had by all those spending time together on the Saturday, shopping and packing the colourful festive hampers. We pray that we all will continue to have compassion over 2013 towards those who are struggling financially in our community. We’ll take a cup of kindness…. Hope for Belper were once again asked if we would like to bless the people at the Christmas Eve Carol Service in the market place. We were fortunate to be able to use the Salvation Army kitchen again and also to have the loan of many large catering pump flasks. Around 800 cups of steaming hot chocolate were served on a very cold night to some very appreciative people. It was great to see some new faces helping out this year including the Belper Baptist Church Youth Group and their leaders. There were some good opportunities for conversations whilst people were stood having there hot chocolate and we felt it was a great way to spend a couple of hours at the beginning of the festive season! Author Paul LinfordPosted on February 28, 2011 January 26, 2019 Categories Hope at ChristmasLeave a comment on We’ll take a cup of kindness…. The annual Hope Banquet was this year held at the Salvation Army hall in Belper Marketplace. Residents from Riverside English Churches Housing were invited, with some coming from the local hostel in Belper and some from Heanor. It was a great afternoon with Christmas dinner and entertainment. About 20 people a mixture from the Riverside Group and four of the churches in Belper enjoyed the afternoon together. Thanks go to all the volunteers who helped to make this happen.